What’s The Most Common Street Name In America? A street sign for Sixth Avenue in New York City. After I tweeted it, I received the following question from Conrad Hackett, a demographer at the Pew Research Center. I’ll try to answer. Why is Second Street more popular than First Street? Before I explored the seemingly strange order of the Reddit list, I wanted to make sure it was based on reliable data. I got in touch with the cartography team at the U.S. Census Bureau, which told me that despite releasing new geographic data in 2014, it couldn’t confirm the accuracy of the Reddit chart because it would take too long to repeat the methodology. The Census Bureau only releases a complex data file of U.S. geographical information, so I’m left with the most recent tidy list it has published on American odonyms (street names). It’s from 1993. That year, the bureau published 76 of the most common street names (why 76 streets and not 75 or 77, I don’t know). The official list also showed that there were more Second streets than First streets. In fact, it found that Second Street was the most common street name in the U.S., with 10,866 streets (that total includes all instances of Second Street and 2nd Street). So, your question still stands, and there’s a pretty simple answer. In cartography, unlike in most competitive sports, second doesn’t necessarily come after first — a Second Street can be the logical next street after a Main Street. If you were to add together the number of streets named First, 1st and Main, you’d get 17,562, which would top the list by a long way. I’ve reproduced the 1993 list from the Census Bureau below and taken the liberty of adding some categories. Those categories reveal some interesting sub-lists. For example, looking at street names that are also people’s surnames, it would appear that George Washington was the most popular U.S. president (or else Americans with that surname are uncommonly famous). True, Washington was also the first president of the U.S. — but as we’ve seen, street naming isn’t just down to who came first. The second most common street name that’s a surname is Lincoln (the 16th president) followed by Jackson (seventh president), Johnson (17th president but also the 36th president) and Jefferson (third). Nature also dominates the list. There are thousands of streets named Oak, Pine, Maple and Cedar. 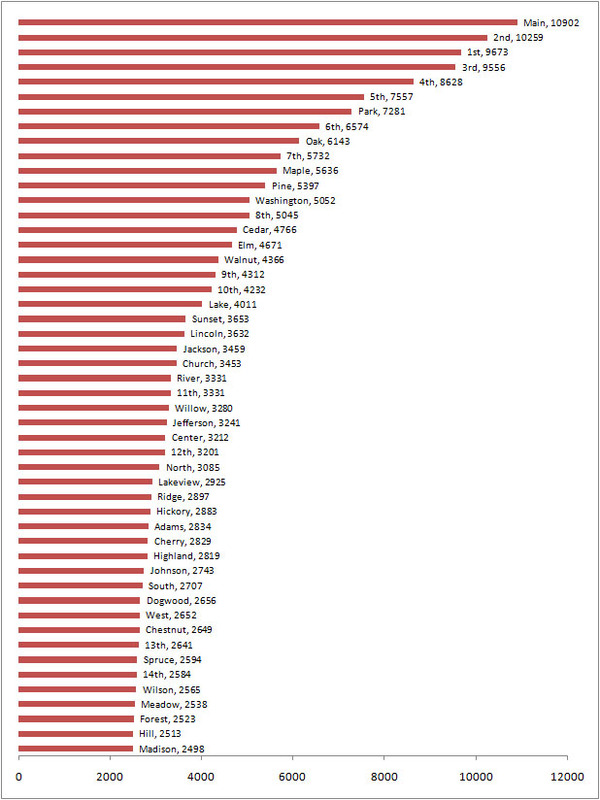 The chart on Reddit that sparked your question looks very different from the 1993 list of most common street names from the Census Bureau. Why, for example are there 3,238 extra Main streets in that chart compared with the census records in 1993? To find out, I got in touch with “darinhq,” whose name is Darin Hawley when he’s not producing charts on Reddit. After speaking to him, I think there are three explanations for the difference between his chart and the official data. First, some new streets may have been built over the past 20 years (Hawley used 2013 census data to make his chart). Second, some streets may have changed their names: If a little town grows, it might change the name of its principal street from Tumbleweed Lane to Main Street. Third, I don’t know how the Census Bureau produced its 1993 list (I asked, and a spokesperson told me the researcher who made it can’t recall his methodology), so Hawley might have simply used a different methodology to produce his chart. Because I wasn’t able to find any data on the frequency that American streets are renamed or the rate at which new streets are being built, I’m going to stake my money on this third explanation. Hawley told me that he counted “Main St N” and “N Main St” as two separate streets in his data. If the Census Bureau counted them as just one street, that could account for the difference. That’s not the only executive decision Hawley made when he was summarizing this data. He set a minimum of how far away one Elm Street in Maine had to be from another Elm Street in Maine to qualify as two separate streets. That’s a problem because streets can break and resume in unexpected ways. Basically, the nomenclature of U.S. geography is hard to pin down. What I can say with confidence is that there are more Second streets than First streets, and that there’s nothing remarkable about that when you consider that a Main Street (of which there are thousands) can also be the next street over from a Second Street. Finally, a point on which Hawley and the Census Bureau can both agree — Washington wins the cartography prize for most common street named after a person. Have a question you would like answered here? Send it to dearmona@fivethirtyeight.com or @MonaChalabi.